The central technological revolution of the 20th century was the development of computers, leading to the communication and Internet era. The main measure of this evolution is miniaturization: making our machines smaller. A computer with the memory of the average laptop today was the size of a tennis court in the 1970s. Yet while scientists made great strides in reducing of the size of individual computer components through microelectronics, they have been less successful at reducing the distance between transistors, the main element of our computers. These spaces between transistors have been much more challenging and extremely expensive to miniaturize – an obstacle that limits the future development of computers. Molecular electronics, which uses molecules as building blocks for the fabrication of electronic components, was seen as the ultimate solution to the miniaturization challenge. However, to date, no one has actually been able to make complex electrical circuits using molecules. The only known molecules that can be pre-designed to self-assemble into complex miniature circuits, which could in turn be used in computers, are DNA molecules. Nevertheless, so far no one has been able to demonstrate reliably and quantitatively the flow of electrical current through long DNA molecules. 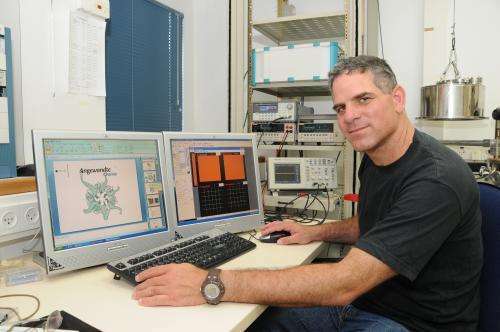 Now, an international group led by Prof. Danny Porath, the Etta and Paul Schankerman Professor in Molecular Biomedicine at the Hebrew University of Jerusalem, reports reproducible and quantitative measurements of electricity flow through long molecules made of four DNA strands, signaling a significant breakthrough towards the development of DNA-based electrical circuits. The research, which could re-ignite interest in the use of DNA-based wires and devices in the development of programmable circuits, appears in the prestigious journal Nature Nanotechnology under the title "Long-range charge transport in single G-quadruplex DNA molecules." Prof. Porath is affiliated with the Hebrew University's Institute of Chemistry and its Center for Nanoscience and Nanotechnology. The molecules were produced by the group of Alexander Kotlyar from Tel Aviv University, who has been collaborating with Porath for 15 years. The measurements were performed mainly by Gideon Livshits, a PhD student in the Porath group, who carried the project forward with great creativity, initiative and determination. The research was carried out in collaboration with groups from Denmark, Spain, US, Italy and Cyprus. According to Prof. Porath, "This research paves the way for implementing DNA-based programmable circuits for molecular electronics, which could lead to a new generation of computer circuits that can be more sophisticated, cheaper and simpler to make." A strand of DNA is around 2 nm wide. That's not so much smaller than semiconductors, which are being fabricated at 22 nm now, projected at 5 nm in 2020. Is there something inherent in this DNA technique that will reduce the tunneling problem?